This past week I had the amazing opportunity to participate in the Vancouver Avocado Showdown at the Pacific Institute of Culinary Arts. The goal was to create a dish to showcase the delicious versatility of avocados. Specifically, Avocados from Mexico, as they make up about 80% of the avocados sold in Canada. This was my first media/food blog event, so to say I was a little nervous would definitely be an understatement. I didn’t know what to expect and I didn’t really know any of the other participants. As usual, I was worried and nervous for nothing. From the cooking demo with Chef Darren Clay to the cocktail demo from Justin Darnes of Drinks, Undressed, along with delicious food and amazing BC wines, the whole night was filled with fun energy. 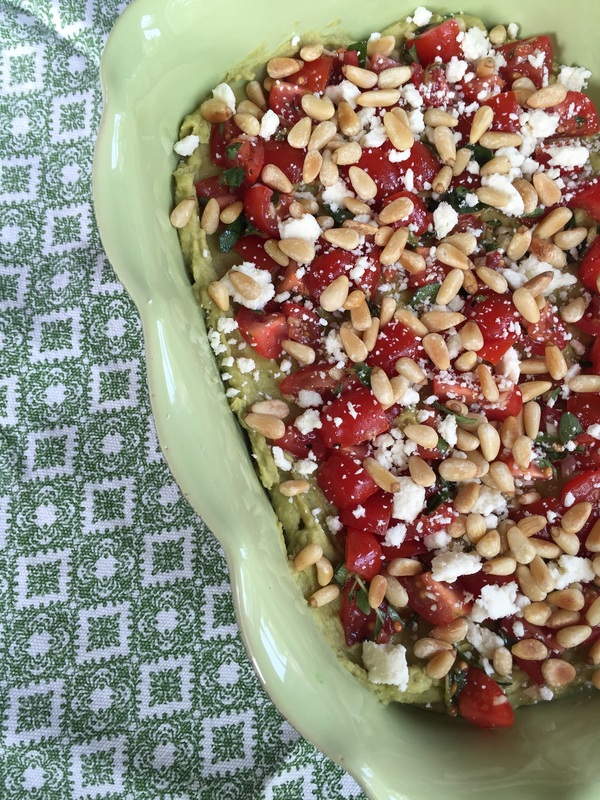 Below is the recipe for the dish I submitted; Mediterranean 4 layer dip. Although it wasn’t the winning dish, I think it’s entirely worth sharing. It’s incredibly healthy, vegetarian, and most importantly, it’s pretty darn delicious. I hope you enjoy it! Place the lemon juice, 2 Tbsp of the olive oil, chickpeas, avocados and mint in a food processor or blender and pulse until smooth. Season with salt. Spread evenly over the bottom of an 8”x8” serving dish. In a medium bowl, combine the tomatoes, garlic, oregano, remaining olive oil, salt and pepper. Toss until well combined. Layer the seasoned tomatoes over the avocado mixture. Evenly sprinkle the feta cheese, followed by the pine nuts, over the tomatoes. Set in the fridge to chill for at least 30 minutes. Serve with crackers or tortilla chips. Congratulations on your first event. As normal we are scared of the unknown. Your dish looks great. Thanks Quinn! It’s so true and I think I may be among the worst as far as freaking myself out goes, lol. This looks so tasty and filled with health. I think it wonderful that you entered the contest – winning is always the best prize – having the courage to enter and compete is quite an endeavor. Maybe the next contest you will win trying. Thanks for sharing on Real Food Fridays. Pinned & twitted. Thanks, Angie. That’s sweet of you to say 🙂 At the event , we all got to try making a dish that the chef demo’d for us. Funny enough it was a shrimp and avocado spring roll. So yummy! I’m not a huge fan of deep frying, either, but they were worth it. Thank you! Pita chips would be great with it. This sounds absolutely fantastic! When it comes to dips, I’ve fallen into a bit of a hummus rut, so this will definitely help me change things up a bit. Yum! Very exciting event and wonderful recipe! Congratulations!